The forms of global political transition contradict each other. The Western leadership of the world seems to be in decline, with the US political and military hegemony being challenged by the rise of China and other emerging powers and with global power structures evolving towards multipolarity. At the same time, however, there are increasing signs of a diffusion of state power. It involves a growing group of non-state actors challenging state power in very different forms and different capacities. This report focuses on the axis of state power considered the most important in terms of its global implications: the relationship between the US and China. This relationship is studied with the aim of assessing how the mutual interdependencies are evolving, and what the goals of the two actors look like in respect of their own global role. The im¬plications of this power transition in the key fields of global governance – also covering the simultaneous diffusion of power to non-state actors – forms another relevant topic under review in the global context. 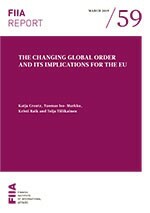 Lastly, the report analyses how the EU contends with these forms of power transition and safeguards its own influence in this changing environment. The project also addresses the international role and influence of one of the northernmost EU members, Finland. 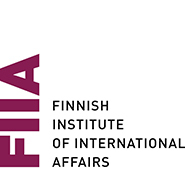 It investigates how the changes in the global and regional setting should be understood from the Finnish point of view and how Finland should act in order to consolidate its international role in economic as well as political terms.